The GREENEST Charging Solutions available! 24-Hour PowerTM Nobody demands more of ZRDTM than us! The Truth about DC's Advantage over AC goes through 3 stages: First it is Ridiculed, Then it is Opposed, & Finally it Becomes Self-Evident! 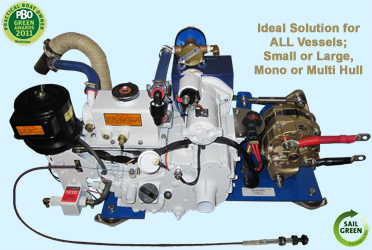 ZRDTM is a Full Service Marine Electrical System Designer & Original Equipment Manufacturer (OEM) - DC Generators, High Output Alternators, Brackets, Power-Take-Offs (PTOs) & Pulleys. ZRD Teaches our Customers so they never have to purchase a second time. ZRD Treats them well enough so they want to - Should the need ever come again! ZRD is proving Edison CORRECT and Westinghouse & Tesla WRONG! Well done is much better than well said! If it has to do with a vessel's electrical system (marine charging or supply, Single or Dual Alternators, 12 volt, 24 volt, 72 volt, 96 volt, 120 volt, 144 volt DC, or 120, 208, 240 volt AC, ZRD is your source for answers, unique requirements, alternator parts and components [alternator mounting bracket, pulleys, universal adjustment arm, transient spike protectors, alternator & battery temperature sensors, 3-stage external regulators, digital remote charging (for charging second battery bank, multiple battery banks, start batteries for engine, or a generator, windlass battery, thruster battery, ... from one charging source - alternator, shore charger, generator, ...), ], and Advanced Charging Solutions. We specialize in methodologies to select, attach (mounting bracket), and install items for/in your vessel. 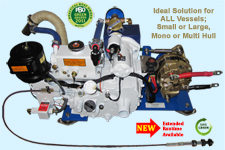 If you need or desire a High Output Alternator, Serpentine or Multi-sheave Power Take Off (PTO) pulley, Lifeline and Sun Xtender AGM Batteries, Generator (DC & AC), Superwind Wind Generators, Dedicated Marine Solar Panels Multi-Stage External Regulation, or Remote battery charging, you should look no further. In addition, ZRD offers complete vessel refit and design services. Our expertise also covers marine air conditioning and refrigeration, especially, how they interface with the electrical system. As a US Certified International Freight Forwarder, ZRD is able to ship our products Directly to you Worldwide. On ZRD alternator webpages, are views of ZRD manufactured Very High Output Alternators used in Second (Dual) Alternator installations and OEM first alternator R&R or upgrades. The High Output Second (Dual) Alternator is available in 12vdc-220amp or 24vdc-90amp. OEM first alternator replacements are available in 12vdc-94* amp or 24vdc-50 amp), with Internal or External Voltage Regulation, and 3.15", 2", or 1" mounting styles. *12vdc - 120 and 140 amp is available (s/o) for post OEM warranty applications. The complete line of ZRD manufactured High Output Alternator Solutions are available in: 12vdc (50 to 300+ amps), and 24vdc (50 to 220 amps), To learn more and see details, CLICK on any alternator picture above. The High Output Second (Dual) Alternator web page has a Movie Icon allowing you to view a few clips (abbreviated 70sec mp4) taken from a 20 minute ZRD High Output Alternator instructional installation video. Finally, you have found what you have been searching for - Without question or compromise, the best DC Generators available. A complete line of DC Generators that offer a multitude of voltages ( 12 volt DC, and 24 volt DC, and amperage combinations up to 800amps are available. Some 12 and 24 vdc models are available with external regulation. All designs have USER Controlled full throttle capability. The ZRD DC Generator solution shown above (ZDCGE1222) may have up to 66 times (6,600%) more amperage available for battery bank charging and may also only require 7% of the engine run time compared to some 120vac Generators using a standard battery charger. Like everything ZRD manufactures, it is the "Rolls Royce" of the industry, but at unexpected affordable pricing. When you purchase one of the many TSPs (Total System Packages) that ZRD, LLC offers, you become a member of the ZRD family. From the start of your relationship, you receive personalized attention, with an honest sincerity not found in many businesses any more. 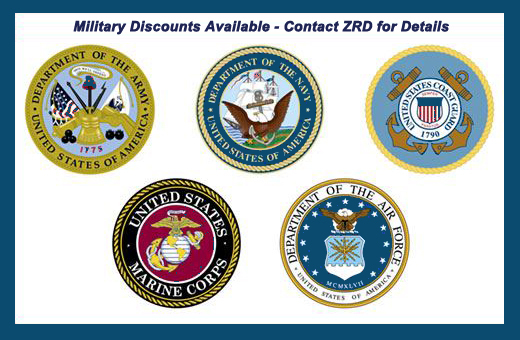 ZRD is a small veteran owned and operated company, proudly designing, engineering, and most significantly actually manufacturing ZRD products in the USA. ZRD employs superior workmanship under exacting quality controls. In-sourcing, Never Out-sourcing is a paramount foundation at ZRD. May we strongly suggest that you review all of the information provided on our web site prior to giving us a phone call or sending an email. The response (information you are looking for) you will likely receive is (more than likely) already posted there in an easy to understand format. It will save you a significant amount of time doing research and it provides valuable information you may not have even known or considered. The website was developed based on the questions we received over the years on a daily basis. We are always adding new, beneficial, and unique questions and scenarios. Many have referred to it as a great free online resource (book). The Product pull-down menus are not just a sales tool. These sub-menus provide valuable information to aid you as you decide on a solution. The FAQs are a MUST READ - especially if this is your first time to the ZRD website. The FAQ section will greatly assist you with your endeavors. It provides clear details on what to do and what to avoid. If you glance over or skip any of these areas, you may miss an important piece of information that could be critical to a safe, reliable, and useful electrical system. To aid in your decision making, a number of myths and outdated technologies are exposed. FAQs Menu Tab #5 and the Company Menus provide information regarding ZRD that may be very helpful. The Links pull-down menu has many extremely valuable resources for you to use at no-cost. Our website is designed for what we would like to find when we are doing our research and investigations. It is for the thoughtful, analytic, consumer. Products Menu Tab #5 has a link to OEM boat builders that have a Professional Attention to Detail. ZRD was selected as a valuable, reliable source for many of their system designs and components. Similar extensive system designs have been provided to US and International customers located around the globe - Europe, South Africa, Australia, SE Asia, South America, Caribbean, & others. Regarding pricing, review the Do Homework First link (FAQs Menu Tab #5). We provide the most cost efficient pricing available. We truly desire to support our end users, unlike the vast majority out there. Discount outlets do not provide any plus they are not able to offer ZRD manufactured products. If all you desire is price, you will probably be on your own to succeed or fail with their lack of knowledge, expertise, and desire to provide support. We assist our customers according to their needs and desires. Experience has shown us that even the best require a small amount of support at some point. We are always there to provide whatever you may need. TOOLS (Links Menu Tab #1) should not be missed. There are many, often overlooked, items of significant importance to every sailor available. Take a look at the many varied links when you have some free time. They are so varied in nature that you need to view each to ascertain their relevance for your situation. All of the links are free. Some links may attempt to induce payments, but they have some great free data available without incurring any charges. ZRDTM products are proudly designed, engineered, and unambiguously manufactured and assembled in the USA employing superior workmanship under exacting quality controls. In-sourcing, Not Outsourcing. As a US Certified International Freight Forwarder, ZRD is able to ship to you Directly - Worldwide. • zrd.com is designed to be best viewed on a desktop, laptop, IPad, or a larger screen Smart Phone. - If you are using a small screen phone, the presentation may possibly be very small and the web page rearranged significantly. Under your phone's browser settings, possibly select Desktop view. Expanded details may be seen without zooming in when the phone is allowed to rotate and be viewed in landscape mode. Androids sometimes wrap text early (Corrected by unchecking autofit under internet settings). • You will miss important information if you do not scroll to the bottom of each web page. • Ensure the Compatibility Mode is turned off (Internet Explorer) or the Blue Video Boxes will not be displayed. • Many photos are links to additional information. - If this feature is unavailable, your cursor may change to a finger point if that item or photo is a link. • The Bookmark function (Favorites) is for IE only. Other browsers, Press control (Ctrl) and "D" keys simultaneously or use browser's bookmark function. • The Menu requires JAVA to be enabled in order for it to function. Non-java-enabled browsers may click on SITEMAP. • There is a lot of useful information on each page of this website. Text and image wrapping is caused by using a small monitor or low resolution. - Turn favorites tab off or zoom out (smaller text size) on your Browser to enable more website details to be seen. • A Google Translate drop down is near the top of each web page to assist our international customers. RELEASE OF LIABILITY: ZRD is a retail supplier of various products. Buyers agree that they are either a properly licensed installer for the products purchased, or will have a properly licensed installer install any products you purchase from us. Buyers hereby release ZRD from any liability resulting from the improper installation or operation of the products we sell. NOTE: All of the information on this web site is believed to be correct at the time of its creation. In order to maintain a high level of quality, ZRD reserves the right to make changes to its products and information in these documents without prior notice. ZRD accepts no liability for typographic errors, omissions, or inconsistencies regarding product information on this website. All rights reserved. Products and companies referred to herein may be trademarks or registered trademarks of their respective companies or trademark holders. Like everything ZRD manufactures, zrd.com is designed, published, & made possible by ZRD,LLC. All information contained is property of ZRDTM. Unauthorized use of text or images without prior permission is prohibited.